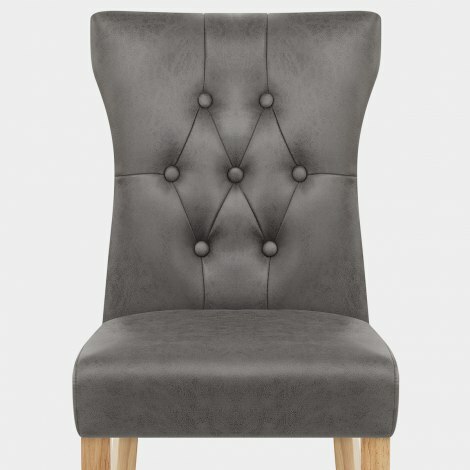 The Bradbury Oak Dining Chair Grey has traditional appeal with a fresh contemporary finish and superior comfort. Guaranteed to be the update your dining area needs, the Bradbury is undeniably fashionable and will add plush comfort to your interior. 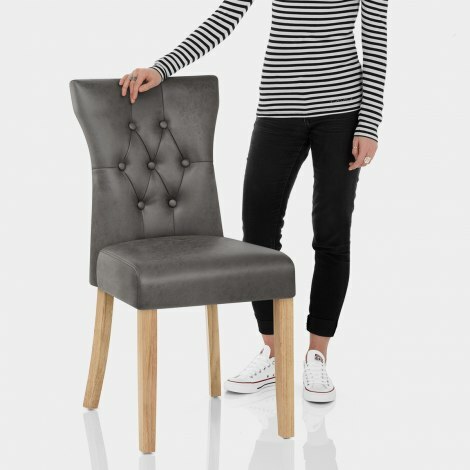 This quality piece has on-trend style with its grey faux leather upholstery, which is inlaid with chic button and stitch detailing. Adding a luxurious quality to the padded seat is the belted frame as it provides fantastic comfort, whilst a tall winged backrest is highly supportive. Crafted from solid wood, the four legs support the seat and display a natural oak finish for classic allure. Finally, the legs are capped by protective plugs to help preserve your floor surfaces. "Look very stylish in my dining room"
Spent quite a while looking for dining chairs before deciding on these. Liked the style and they seemed good value. Bit concerned they would be cheap but no need to worry. Very well put together and look very stylish in my dining room. Very comfy too. Pleased with them and would recommend.